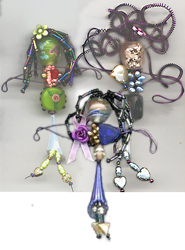 Kits to make handcrafted jewelry, ornaments and gifts for parties, fundraisers, and workshops! Party Kits - Craft an event where everyone gets to make a piece of art! With group/party/workshop pricing! The CD Evening Bag Recycle with style! Using CDs and some clever design, make a fabulous evening bag that will make a statement! You have several assembly choices that produce VERY different results. From a '20 flapper style bag to a thoroughly modern design statements... it is up to you. Great kit for teens and tweens!Kit contents and details, plus other options. The The Vintage Treasure Montage recycles vintage jewelry pieces into pendants and pins. Includes everything you need. Each kit is one of a kind. Available in 2 versions, plus you can buy the filigree bases and bags of "vintage bitz". Kit details, refills and extra parts available. Flower Dancer Earrings! 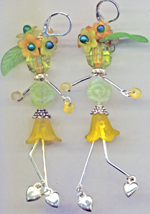 Cute flower-skirted dancers with bugle bead legs dangle and "dance" from your ears. 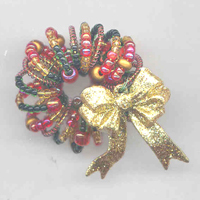 Flower beads have become the skirts, with colorful leaves, tiny buds and blossoms adorn the head. Kit details and contents. Group kit (makes 6 pair) $100.